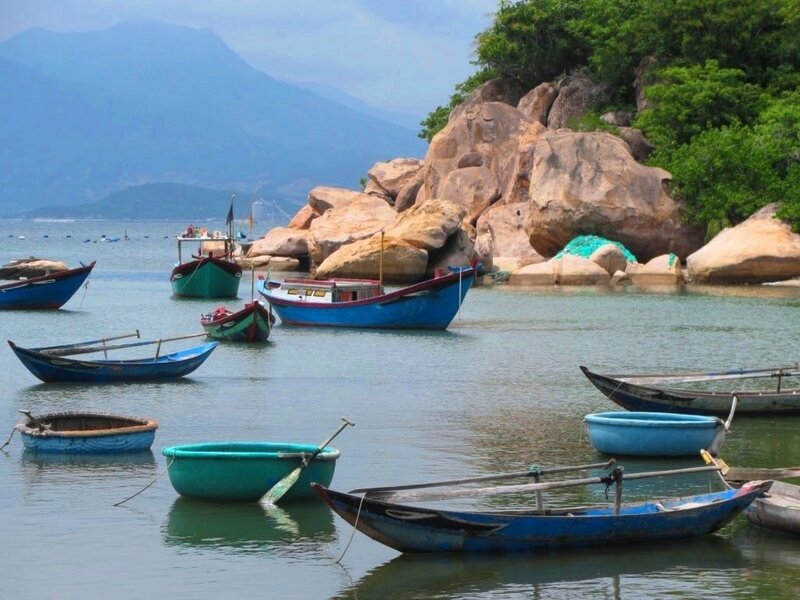 Filled by the calm, glistening waters of the East Sea, Cam Ranh Bay, just south of Nha Trang, is a splendid natural harbour surrounded by hills. From its southern shores, a finger of land points northwards into the bay: This is Cam Lap Promontory, one of those rare places that’s easily accessible yet undeveloped and utterly beautiful. It’s the kind of place you fall in love with, and one that, for the time being, really does deserve the overused epithet of ‘hidden gem’. Beaches don’t get much better than this in Vietnam, and yet, if you visit on a weekday (avoiding weekends and national holidays), you will probably have the chalky, white-sand, boulder-studded beaches and mirror-flat, jade-blue sea all to yourself. This is my guide to one of my favourite corners of coastal Vietnam. Often dubbed ‘Vietnam’s Maldives’, Cam Lap Promontory is in the perfect stage of development: fairly easily accessible but far enough from the beaten track to ensure that few travellers make it here; a handful of good accommodation options but large-scale construction has yet to arrive; locals are welcoming and friendly to foreign travellers, not cynical and predatory as they can be in the more popular beach towns. 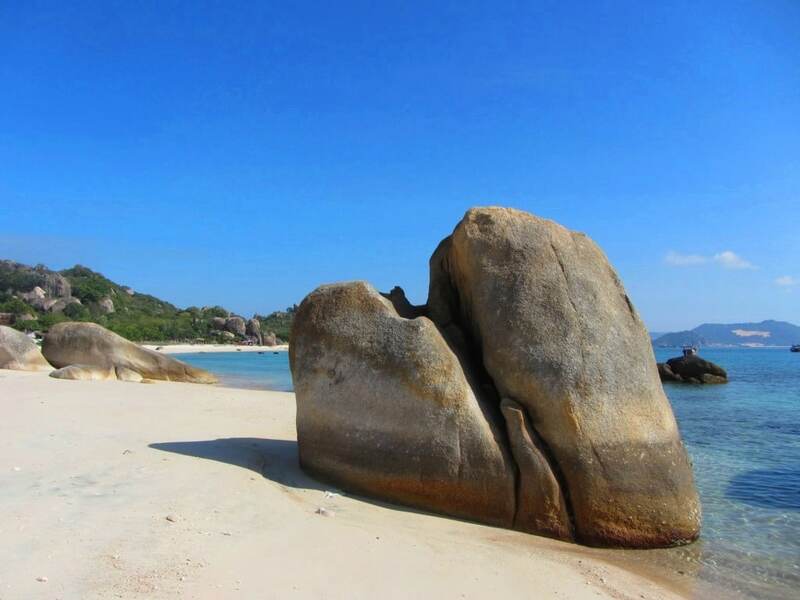 Cam Lap Promontory makes a rewarding day trip from Nha Trang or Phan Rang, or as a destination in itself for those who like their sandy beaches less trodden. 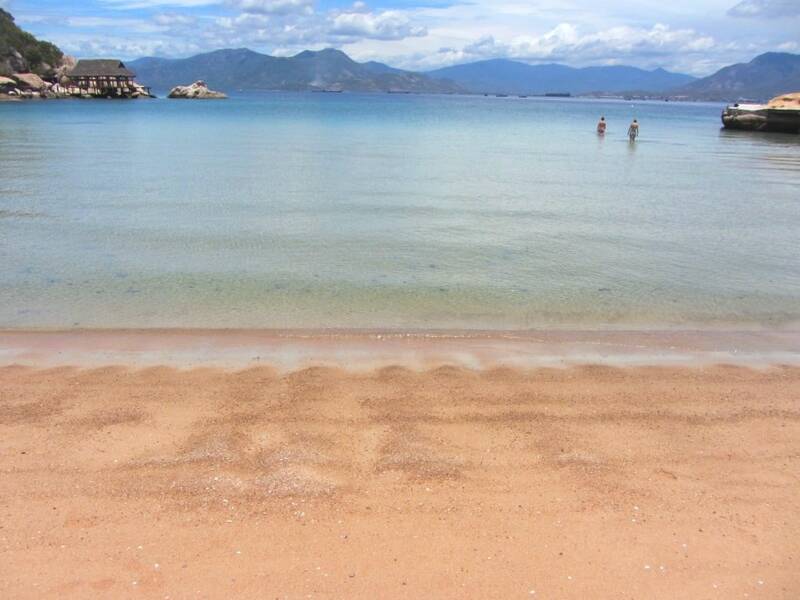 Weather in Cam Ranh Bay is pretty good year-round and it receives less rain than Nha Trang, just 70km to the north. My favourite time to visit is the height of the dry season, from January to April. 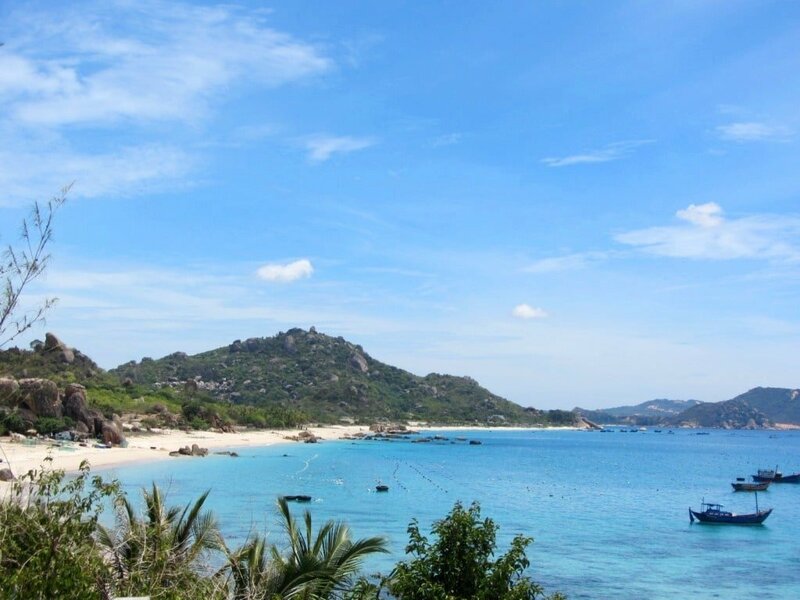 Almost equidistant from Nha Trang (75km to the north) and Phan Rang (65km to the south), Cam Lap Promontory is a rugged horn of land projecting into Cam Ranh Bay. Accessed via a steep, narrow, paved lane leading north from the spectacular Nui Chua Coast Road, the promontory is made up of giant boulder piles which rise from the calm, blue waters of the bay. Despite all this rock, the entire peninsular is cloaked in foliage: eucalyptus plantations occupy the high-ground, giving way to shady groves of cashew and mango trees on the low-ground. The trees and boulders continue right to the waters’ edge, where the waves have slowly eroded the rocks into fine white sand. The eastern side of the promontory boasts a series of gently arcing bays with excellent white-sand beaches separated by giant boulders lying in the sand like unfinished sculptures; there’s even some decent coral just offshore. The western side is more rugged, characterized by a handful of sheltered coves which provide natural harbours for small fishing fleets and remote settlements. Although the sand is not as dazzling on this side of the promontory, the water is exceptionally calm and blue, and there are a couple of wonderfully secluded bays. There are places to stay and eat on both sides of the peninsular. There’s only one road on the promontory, which splits into two branches: eastern and western. The former leads through fruit orchards, past white-sand beaches (generally referred to as Binh Lap Beach), and all the way to a small village near the tip of the promontory, known as Mũi Sộp. The western branch leads through a pleasantly sleepy fishing hamlet, called Binh Lap Village, from where the road climbs over to another remote hamlet in a sheltered cove. Exploring the fishing communities, fruit plantations and beaches on two wheels or on foot is a very rewarding way to spend a day or two. This is a peaceful, calm, friendly, warm and welcoming, and extremely pretty place to be. 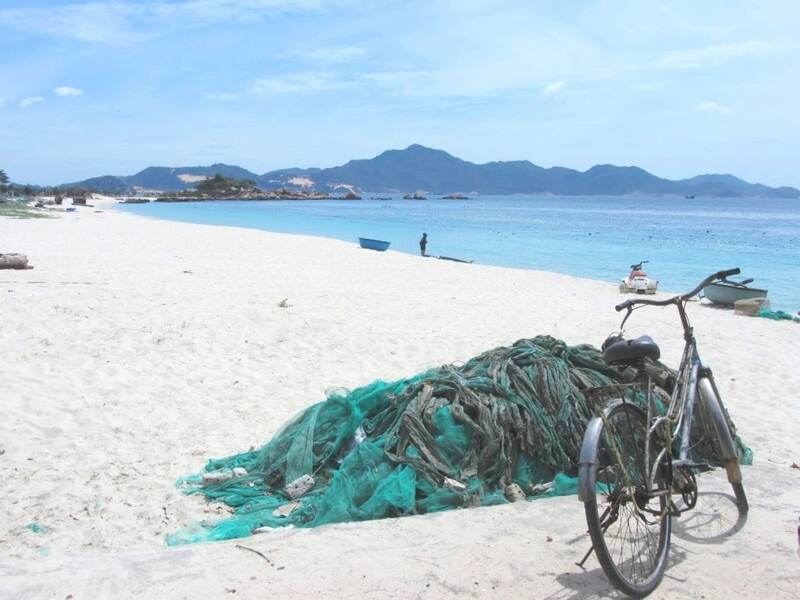 (Note that, although the water quality, beaches and general level of cleanliness and sanitation on Cam Lap Promontory is good, prepare yourself for the build-up of trash in the fishermen’s bays; a common sight all over Vietnam). Unsurprisingly, the main industry here is fishing, specifically squid and lobster. The squid fishermen go out into the bay in the evenings, returning early to mid-morning, when they can be found in the narrow back-streets of the fishing hamlets, eating snacks and drinking beer and rice wine before going to bed. At some of the accommodation options you may be able to arrange a night out on-board one of the squid fishing vessels. The lobsters are farmed in cages submerged in the seawater; you’ll see (and smell) the barnacled cages drying in the sun on the beaches. Most of the bays on Cam Lap Promontory are still working beaches: they haven’t been cleaned up for tourists, so you’ll see boats coming ashore with their catch, and woven coracles floating just offshore tending to their fishing nets. Needless to say, both the squid (mực) and lobster (tôm hùng) are fantastic here: look for them on the menus in the places to eat. Because Cam Ranh Bay is such a good natural harbour, it has a history of military importance: both the USA and the USSR had naval stations here in the 20th century, and today the Vietnamese navy control it tightly. This is one of the reasons given to me by local people when I ask why such a beautiful place has yet to see significant development (not that I’m complaining about it, of course). Although tourism has reached Cam Lap Promontory, it’s still in its infancy, and this is a big part of its appeal. Accommodation ranges from beach camping to cozy dormitories to plush villas on stilts above the bay. Personally, I find the scenery here intensely pretty, the seafood fresh and delicious, the fishing villages charming and laid-back, and the people warm and welcoming: I was smitten from my very first visit. Dao Hoa Vang; (50,000-500,000vnd); www.facebook.com/daohoavang; 090 991 7881; [MAP] The newest addition to the spattering of accommodation options on Cam Lap Promontory is great news for budget travellers. 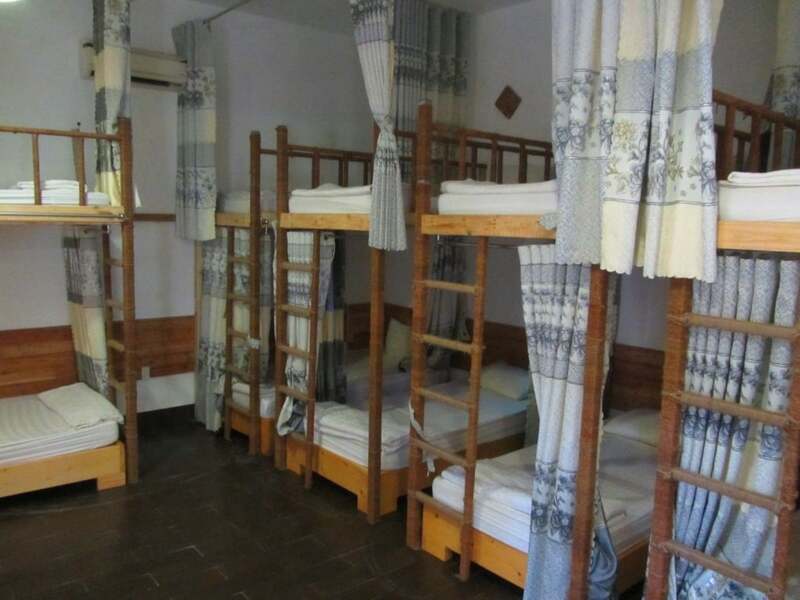 Dao Hoa Vang has excellent dorms for 120,000vnd per person. The comfortable bunk beds are arranged in a clean room with a decent shared bathroom, just a couple of minutes’ walk for the beach. There are also private bedrooms sleeping 2-5 people (500,000vnd) set in a shady garden. The beach belonging to Dao Hoa Vang has a few wood and canvas beach huts (500,000vnd) for couples. 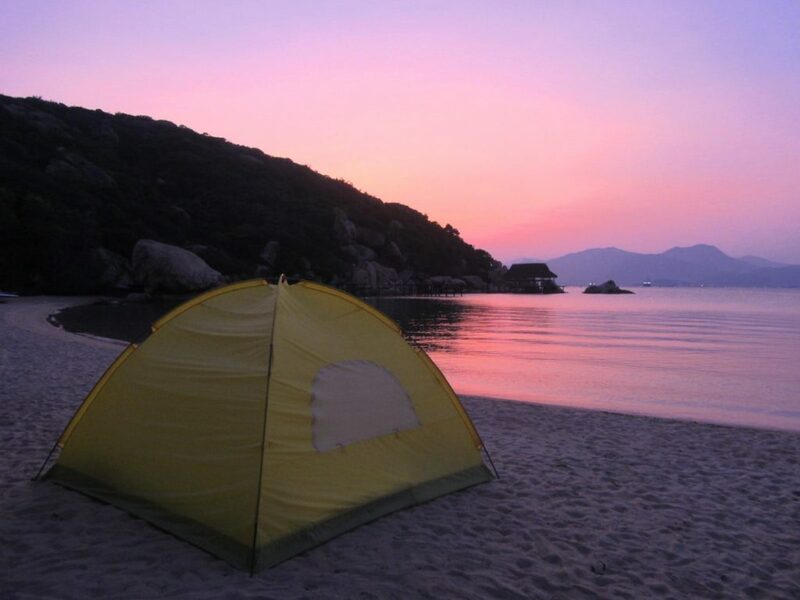 In addition to this, you can camp on the beach: 50,000vnd to pitch your own tent, or 200,000vnd to rent a tent. It’s all pretty good value and there’s an appealing young-Vietnamese-backpacker vibe to this place. Ngoc Suong Yen Bay Resort (camping); (300,000-700,000vnd); www.ngocsuong.com.vn/yen-resort; (+84) 58 2222 892; [MAP] Although the rooms at this spectacularly located resort are upwards of $100, there’s a great deal for budget travellers if you camp here. Accessed via a dirt road from the eastern side of the promontory that leads over to the western side, the resort allows you to pitch your own tent on the beach for 300,000vnd (up to 3 people per tent) or rent a 2-person tent for 500,000vnd (or 700,000vnd if you want to include breakfast). You must also pay a 50,000vnd entrance fee. It may sound a bit dear for camping but, trust me, once you see the ‘campsite’ you’ll immediately change your mind. There’s lots of sandy space under coconut palms leading onto a glorious double beach where you can set up camp. Bathrooms aren’t great, but who cares. What’s more, if you visit on a weekday, you may have it all to yourself. Inquire at the resort reception for camping equipment and payment. Bai Tam Anh Tu; (50,000-150,000vnd) 0163 585 9541; [MAP] Further up the concrete lane, beyond Dao Hoa Vang and Binh Chau, there’s see a sign on the right for Bai Tam Anh Tu. A cashew and mango orchard on raised ground above a boulder-strewn beach bursting with tropical colour, camping here is very atmospheric indeed. In theory, you can pitch your own tent anywhere on the grounds (including under the thatched gazebos), or swing yourself to sleep in one of their hammocks, or lie out on the ground in a sleeping bag under a mosquito net (50,000-150,000vnd for any of the above). However, last time I visited, the friendly family in charge were a little unsure of their prices and policies for foreigners staying here. But, after a polite chat and sitting down for a drink with them, I would expect everything to work out fine. Bai Tam Binh Chau; (100,000-700,000vnd) 090 5166 629; [MAP] Next door to Dao Hoa Vang, Binh Chau is a simple place with lush gardens and a glorious beachfront. There are a few clean rooms with air-con (400,000-700,000vnd) or you can pitch your own tent on the sand for 100,000vnd, or rent a tent for 200,000-300,000vnd for 2-4 people. If you’re camping, the showers are a bit rustic, and on weekends and public holidays the peace is occasionally disturbed by groups playing loud music. But most of the time it’s quiet, pristine and laid-back. Nha Nghi Kim Xuyen; (300,000vnd) 01663 027 982; [MAP] If you look hard, you’ll find this little, local guesthouse right at the end of the road, in the last fishing village on the promontory. It’s not especially clean or cheap so there’s not really any reason to stay here. There are a couple of other nhà nghỉ (local guesthouses) and nhà trọ (local inns) on the promontory, but again I don’t see why you’d choose to stay in them when you can either rent a tent for 200,000vnd at Binh Chau or a bunk bed for 120,000vnd at Dao Hoa Vang. Wild Camping; (free) [MAP] Before reaching Binh Lap Village, the road passes over a hill covered in eucalyptus forests and cashew plantations. You’ll see dirt paths leading off the road and into the trees on both sides of the road. Several of these paths reach sandy clearings on high-ground with superb views over Cam Ranh Bay. If you have your own camping equipment, nothing quite compares to setting up camp under a tree and boiling a brew to watch the sunset over the bay. If you do camp, make sure you are as discreet as possible, and set an example for other travellers – both foreign and domestic – by not leaving your trash behind. Sao Bien Cam Ranh; (500,000-1,000,0000vnd); www.saobiencamranh.com; 090 366 9363; [MAP] On the western side on the Promontory, take the road beyond Binh Lap Village following the signs for Sao Bien (also known as Starfish). Remote and hidden, this cluster of accommodation options is accessed by a very steep downhill pathway – something to bear in mind if you have small children or trouble walking up and down steep hills. 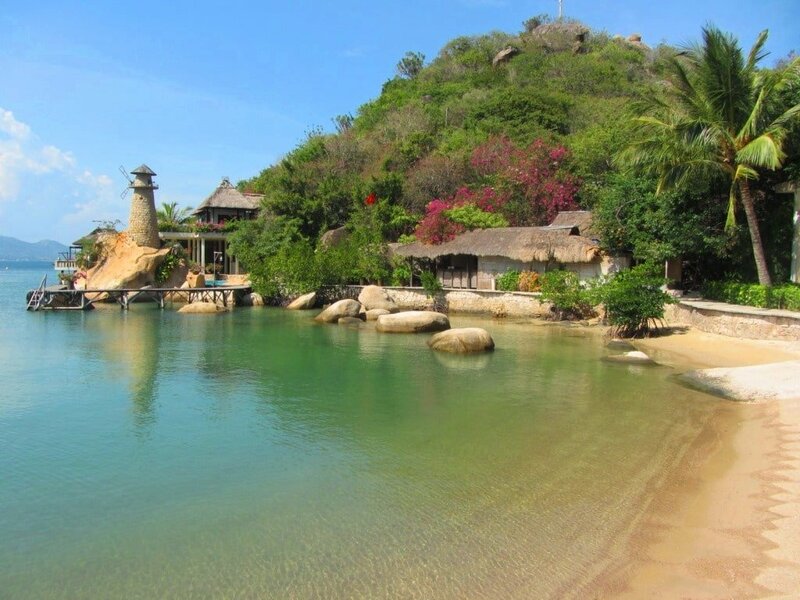 The bay here is gorgeous; a bit like a smaller and more secluded version of the one at Ngoc Suong Yen Bay Resort. The sandy cove is bisected by large, smooth boulders from which steps have been cut and slides attached. The water is beautiful and calm; the swimming is excellent. Accommodation ranges from fan-cooled, hobbit-sized, wooden A-frame beach huts with shared bathrooms (500,000vnd for 1 or 2 people) to air-conditioned, white-washed brick bungalows and villas (800,000-1,000,000vnd). The beach-side gardens are beautifully landscaped and it’s all very cosy and nicely set up, but prices are just a little bit too high, in my opinion. However, the room rates include use of all the activities on site including, among other things, kayaking which is great fun in the calm bay. Ngoc Suong Yen Bay Resort; ($100-$150); www.ngocsuong.com.vn/yen-resort; (+84) 58 2222 892; [MAP] This is one of those places that leaves you open-mouthed the first time you see it. 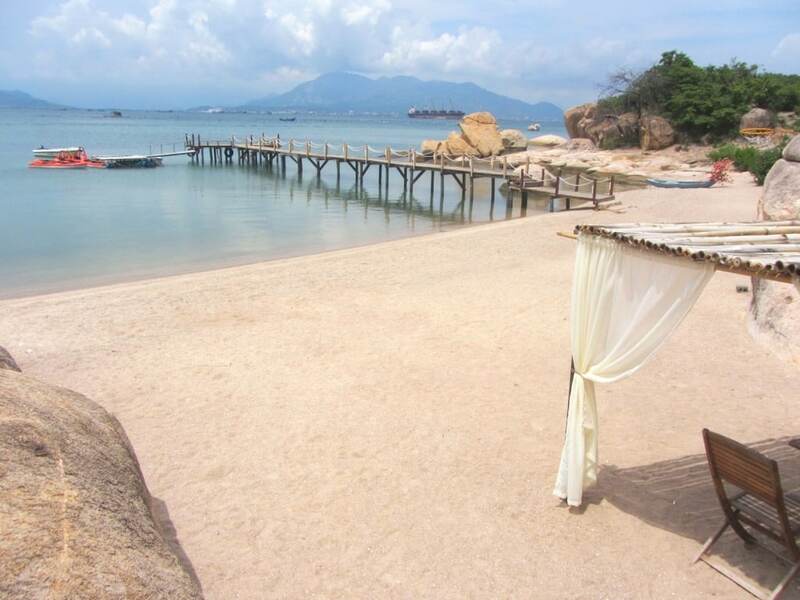 The location has to be among the loveliest of any beach resort in Vietnam and, considering this, the prices aren’t so bad (although the rooms could do with some maintenance and TLC). As you take the eastern branch of the road leading along Cam Lap Promontory, there’s a small sign on the left for Ngoc Suong Yen Bay. Pass the guard in the kiosk (paying the 50,000vnd entrance fee) and continue on the dirt road through cashew trees to the western side of the promontory. Here, you’ll lay eyes on a stunning double bay, divided by a chain of boulders sculpted into strange shapes by the sea. Yen Bay Resort is famous among Vietnamese travellers for it’s position and its seafood, but foreign travellers rarely make it here. 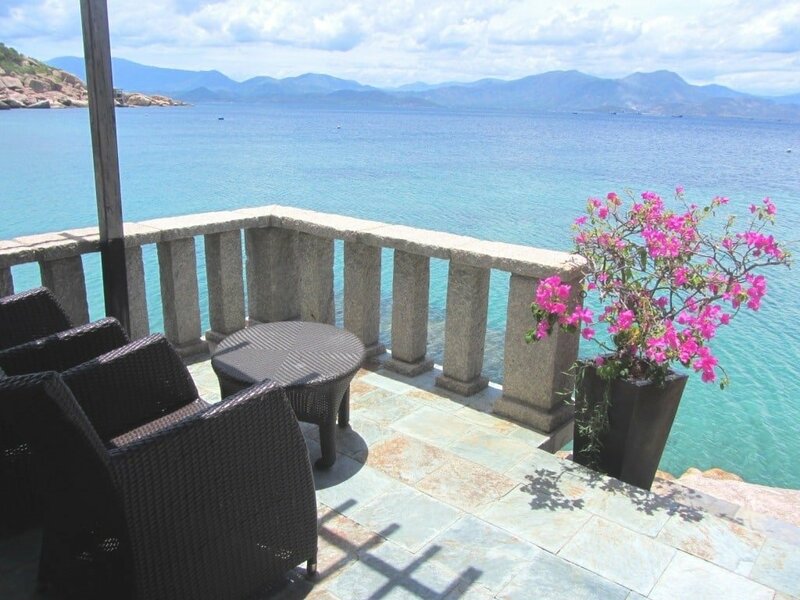 There are only 8 rooms, most of which are standing on concrete stilts over the glistening, calm waters of Cam Ranh Bay or nestled among the boulders. It’s possible to jump into the sea from your balcony and the swimming is great. Rooms are nicely furnished but showing their age: indeed, much of this resort needs attention (the raised wooden-plank walkway between the villas is extremely rickety and pretty dangerous for children). But these ‘faults’ are part of what keeps prices relatively low, making Ngoc Suong Yen Bay the ‘poor man’s’ Six Senses Ninh Van Bay, or as I prefer to say, ‘it’s got character’. Although Cam Lap Promontory has relatively few places to eat and drink, the quality of the seafood is terrific and the location – think tables and chairs on white-sand beaches with waves lapping just a few feet away – makes up for the lack of variety on the menus. All of the accommodation options listed above either have a restaurant, cafe or bar, or at the very least can arrange food and drinks for their guests. (Remember that you can just have a drink at any of these places and then take a dip in the sea and relax in the deck chairs on their beach.) 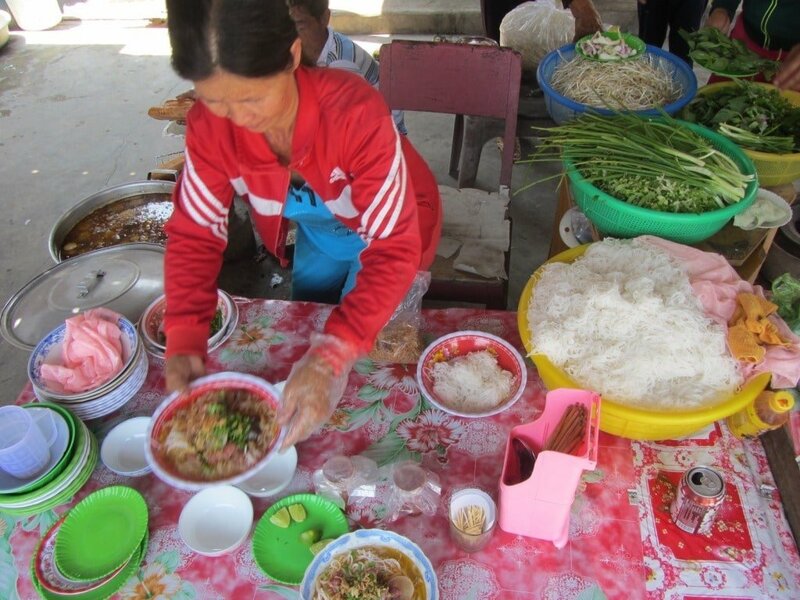 In addition to this there are several informal local eateries and street food vendors in the fishing hamlets. Ngoc Suong Yen Bay Resort; (starting from 100,000vnd per dish) [MAP] The company which owns this resort, Ngoc Suong, is famous for its seafood restaurants, most of which are in glamorous locations around Vietnam. The menu at Yen Bay Resort is not as extensive as other Ngoc Suong locations, but the seafood is fresh, beautifully presented, and delicious. Prices are pretty reasonable for standard dishes, but most of the fresh seafood is sold by the kilo, changing each day according to the catch. Beer, soft drinks and juices are a couple of dollars each (adding a few cocktails to the menu would be a good idea). Food and drink aside, this has to be one of the most beautifully situated restaurants in Vietnam: even if you’re not staying in the rooms or camping on the beach here, drop by for a drink just to gawp at the gorgeous location. Binh Lap Village; [MAP] Take a stroll around the small and quiet streets of this fishing village and you’ll see a handful of quán ăn (local eateries) and bánh mì (baguette) stalls. In particular, look out for Quán Cây Xoài, Quán 3 Chị Em, and Quán Làng Biển Bình Lập, all of which are located just after the 3-way intersection before entering the village proper. Venture further into the narrow streets, towards the fishing harbour, and you’ll stumble upon a couple of street food vendors selling soups, baguettes and other snacks. I’ve had some lovely little meals in this village over the years. Try to visit during Vietnamese meal-times otherwise everything will be closed: 7-8am, 11am-12.30pm, and 5-6.30pm. The other fishing hamlets on Cam Lap Promontory also have local eateries, so it’s worth doing some exploring. Binh Chau & Dao Hoa Vang; (starting from 100,000vnd per dish) [MAP] Both of these accommodations have attractive, informal restaurants on a good stretch of chalk-white beach. 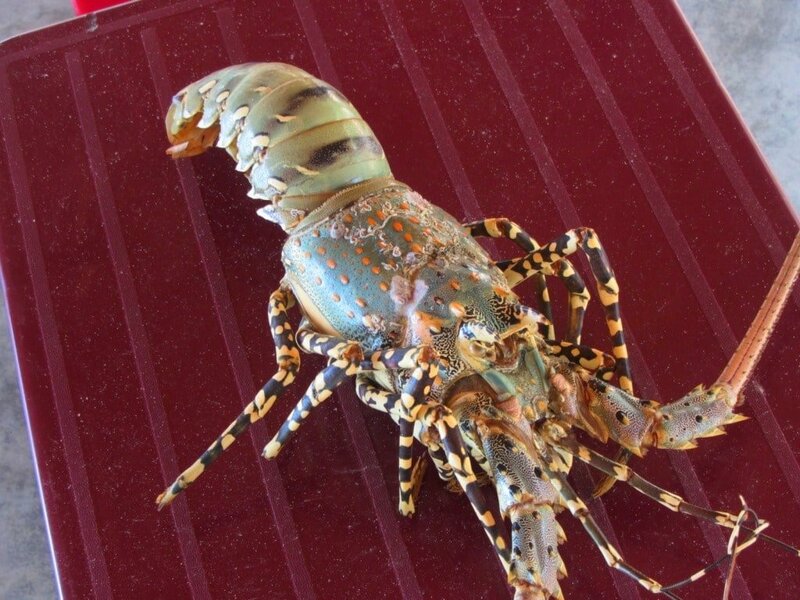 Fresh seafood – including lobster, shellfish, and fish – is available for around $5 upwards. In my experience, the quality at Binh Chau is hit and miss, but Dao Hoa Vang is better, although it’s hard to ignore the musty smell coming from the lobster cages drying on the beach. 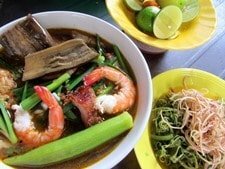 Bãi Tắm Anh Tư; (starting from 50,000vnd per dish) [MAP] The friendly family at this beachside shack can cook you up simple noodle and rice dishes for a couple of dollars, or splash out on freshly caught lobster, squid and other seafood. It’s all cooked in the family kitchen next to the hammocks swinging under thatched huts by the beach. This is a no-frills seafood bonanza that would cost an arm and a leg in most Western countries. Sao Bien Resort; (starting from 100,000vnd per dish) [MAP] The beachfront restaurant and bar here are very good. From fresh and fancy seafood dishes to good old Vietnamese classics, the quality and variety is excellent. Prices are a little higher than you’d pay in Nha Trang for similar food, but just look at the bay you’re eating next to and you’ll soon come to terms with the extra few dollars. 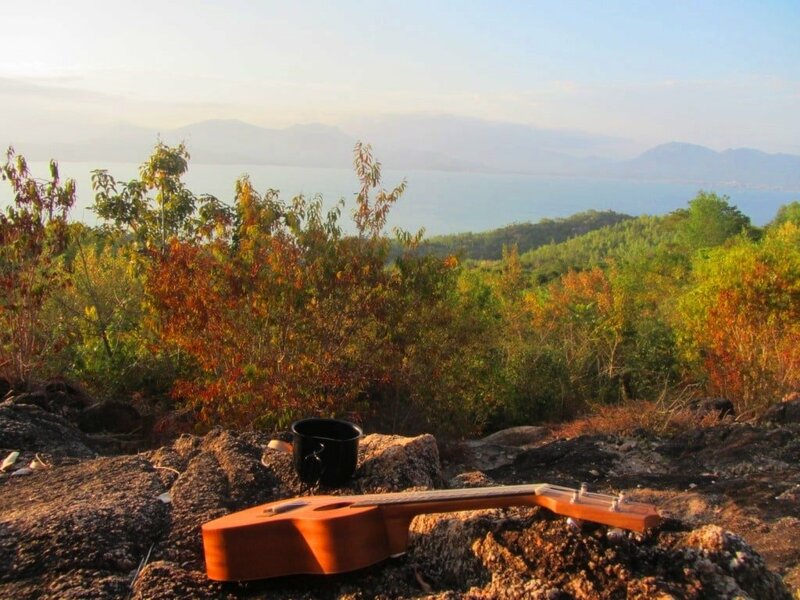 Pop music is sometimes played at an irritating volume from the bar – a common nuisance in Vietnam, especially in places like this, where surely nature is the only soundtrack you need. Local Shops; [MAP] If you’re camping on the promontory then you can find supplies – such as instant noodles, snacks, bottled water, batteries – in the small local stores in Binh Lap Village. 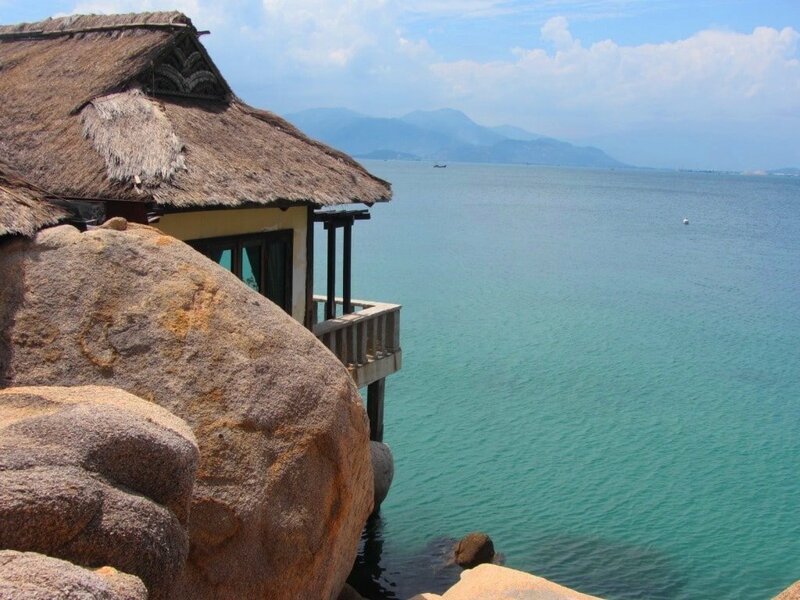 Cam Lap makes a good day trip from the popular beach town of Nha Trang. You can either take a taxi (expensive but easy) or hire a motorbike and ride there yourself. It’s a 150km round trip, which is a fairly long ride for a day, but it’s a beautiful and exciting road trip. Take the clifftop ocean road (DT6571) south out of Nha Trang towards Cam Ranh Airport. Continue past the airport and turn right (due west) over a bridge until you join Highway 1 (QL1A). Turn left (due south) onto the highway and continue for 25km before turning left (due east) onto the Nui Chua Coast Road (DT702). Just after the road skirts the bay, turn left (due north) on a small, paved lane that leads up and over to Cam Lap Promontory. Journey time is around 90 minutes to 2 hours. 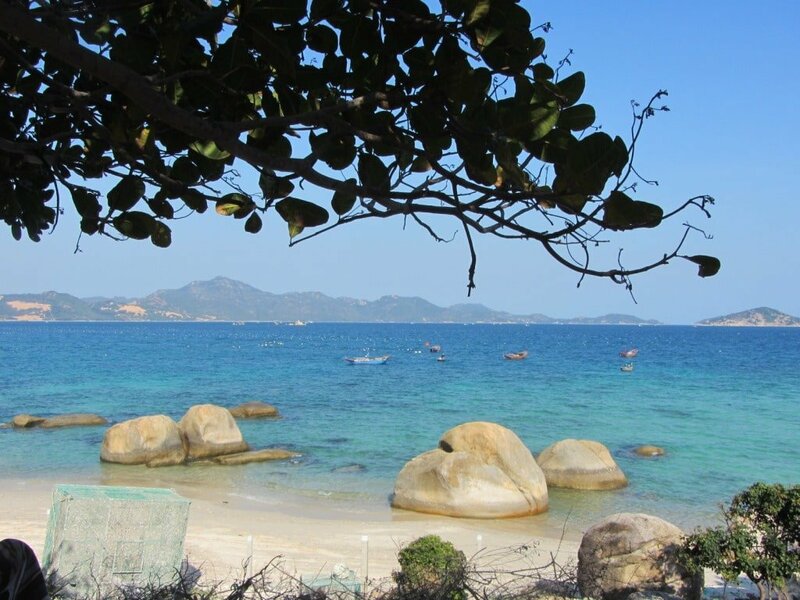 Although few people choose to stay in Phan Rang, it’s a great place with a good beach and lots of seaside accommodation. It’s also the gateway to the Nui Chua Coast Road (DT702), which winds east and north of Phan Rang around a spectacular headland, before dropping down into Vinh Hy Bay and continuing westwards to the turning for Cam Lap Promontory. This is a fabulous 90 minute (65km) ride in either a taxi or a rented motorbike from Phan Rang. Alternatively, you could take Highway 1 (QL1A) which ploughs west of the headland, and meets the Nui Chua Coast Road at its northern tip. From here, turn right onto the Nui Chua Coast Road and then left (due north) just after the road skirts the bay. Although this is the shorter route (45km), you’ll miss all the great coastal scenery. You can reach Cam Lap Promontory from Saigon by motorbike, bus, or train. By motorbike it’s a long but beautiful road trip on the Ocean Road (470km) or a shorter but horrible ride on Highway 1 (370km). Either way, it’s at least a 2-day ride, depending on your level of motorbiking experience and stamina. Alternatively, you can also take any of the regular buses that ply Highway 1 from Saigon to Nha Trang, and ask to be dropped off at Cam Ranh City. From here you’ll need to get a taxi or xe ôm (motorbike taxi) to take you the last 25km to Cam Lap Promontory. The other option is to take one of the several daily trains from Saigon to Nha Trang and get off at Thap Cham (Phan Rang) station. From here you’ll need to get a taxi, xe ôm, or rent your own motorbike to cover the last 50-60km to Cam Lap Promontory (as outlined in the ‘From Phan Rang’ section above). 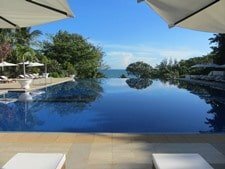 This entry was posted in ALL, Beaches, DESTINATIONS, Off Beaten Path, The South and tagged beach, Binh Lap, Cam Lap, Cam Ranh Bay, guide, Ngoc Suong Yen Bay, Nha Trang, travel, Vietnam. Bookmark the permalink. Thanks for the updates. It’s good to know that Cam Lap is still accessible, despite the loss of the bridge. We are at the promontory at the moment. We came by bike – there is a small temporary bridge built to cross the river. I did not see a way for cars to cross. Thanks for this detailed article! We’re at Cam Lap now and loving it. Just wanted to update everyone that the bridge that leads to the promontory is broken and currently crumbling into the sea: our accommodation said it had been broken for around a month. There’s a group of local guys who will take your bike and ride it down a very very steep dirt path onto a makeshift raft, on which you cross to the promontory. They seem to know what they’re doing, but if you’re on your prized antique Ducatti and worried about a stranger offroading it basically off a cliff you may want to reconsider Cam Lap in the immediate term. PS. It is VERY nice though. Thanks for the update. I had heard about the bridge and issued an update on social media a couple of weeks ago. Good to know the makeshift ferry service is still operating. I’m sure it won’t be too long before the bridge is fixed one way or another. Great to hear that you’re enjoy the area. Just to add you can ride it across y yourself. The locals will charge 30,000 each way for you and your bike to cross with them riding it. I rode across not problems just take it slow! Thanks for the update. However, when was this? I was there a couple of weeks ago at the beginning of February, and a new (but temporary) bridge had been constructed for motorbikes and pedestrians, for which there was no charge to cross. What a wonderful blog about my country Vietnam. Thank you very very much for such passion about our homeland, even bad government now destroying its natural beauties one by one. I found your website while searching information about scuba diving in Con Dao island, and later spent almost 1 afternoon reading every other wonderful information you giving here again to check if I missing any of those experiences. Since you have been to many beaches and island, please share your stories and review about some other places like: Hòn Khô, Kỳ Co (in Binh Dinh province), Hòn Nưa (in Phú Yên province); Bình Hưng (near Cam Lập, in Khánh Hòa province) and if you’re adventurous enough, consider going to Phú Quý Island – the last frontier of Vietnam sea. What a pity, since you’re not Vietnamese so you can’t enter the wonderful tiny island of Bình Ba in Cam Ranh, so far the best island of Vietnam in my point of view. These places are unknown for foreign travelers, even our ordinary countryman. Thank you again for this beautiful conner on the Internet. Thanks, it’s great to hear you’ve enjoyed reading my site. Yes, I agree, it’s a shame foreign travellers can’t go to Binh Ba, but it is very popular with Vietnamese travellers now – most of my Vietnamese friends have been there and like it. I’ve been to Binh Hung, but it’s quite busy with tourists now days, that’s why I prefer Cam Lap. I’d love to go to Phu Quy – I tried once but the boat was cancelled because of bad weather. However, there’s a new Superdong boat starting this month so perhaps I will be able to try to go there again. I’ve also been to Hon Nua, but that was a long time ago. I hope you continue to enjoy Vietnam’s beaches. Great news! I can’t wait to read your review of Phú Quý island. I hope you keep doing well in Vietnam. 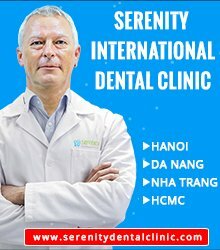 Please announce on Facebook or this website when you are in Hanoi. I really want to buy you few glasses of beer for your introduction about Vietnam! Thanks, Tuan Anh. That’s very kind of you. Here’s yet another commentary about our recent visits. We were in Cap Lap promontory a few days ago and totally enjoyed this area. Quite frankly, we were a bit worried about what we’d find there; Diep Son wasn’t as great as expected, and a bit further South we absolutely hated Doc Let where we found the scenery ugly (both of these being maybe related to the destructions caused by the recent typhoon). Reaching Binh Lap by bicycle wasn’t easy; the slopes leading to the village are extremely steep. But once we were there… we just didn’t want to leave this area ! It felt very secluded, as if we were in an island. Dao Hoa Vang homestay was great, with friendly staff, nice rooms (apart from the dysfunctional shower) and a very beautiful beach. Food at the beachside restaurant was tasty; being there for dinner, hearing the waves under a very bright full moon was wonderful. The scenery at Ngoc Suong resort was just wonderful; however one small drawback of this place was the large amount of tourists who come there by bus in order to take pictures (I still wonder how these large vehicles can move in these small roads). Large tourists groups have a tendency to disturb the serenity of this beautiful settings ! 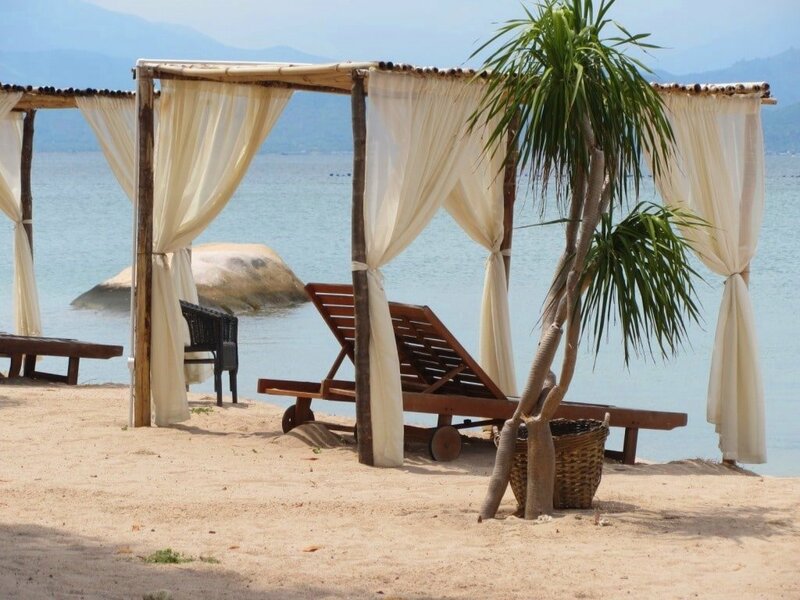 While the scenery at Sao Bien was less striking, we loved the decoration there; spending an afternoon on the beach and enjoying a drink at the bar was a real pleasure ! The restaurants in the village seemed to be closed, probably because it was low season; the exception was the one nearby the harbor. Apart from a small restaurant selling rice porridge and a few banh mi stalls, another opportunity for budget food is the café at the entrance where one can get instant noodles. One possible addition to the article would be to warn that there’s no ATM in the area; most travelers usually bring enough cash but it’s always nice to point this out. Since we started cycling in Vietnam in late November, Cam Lap promontory was the first time we really saw a beautiful coastal area; it was also the first time that we kind of felt sad to leave a place. So, again, many many thanks for this article. We wouldn’t have gone there without you, and we would have missed a wonderful place ! Good point about the ATMs. I just have a short question. 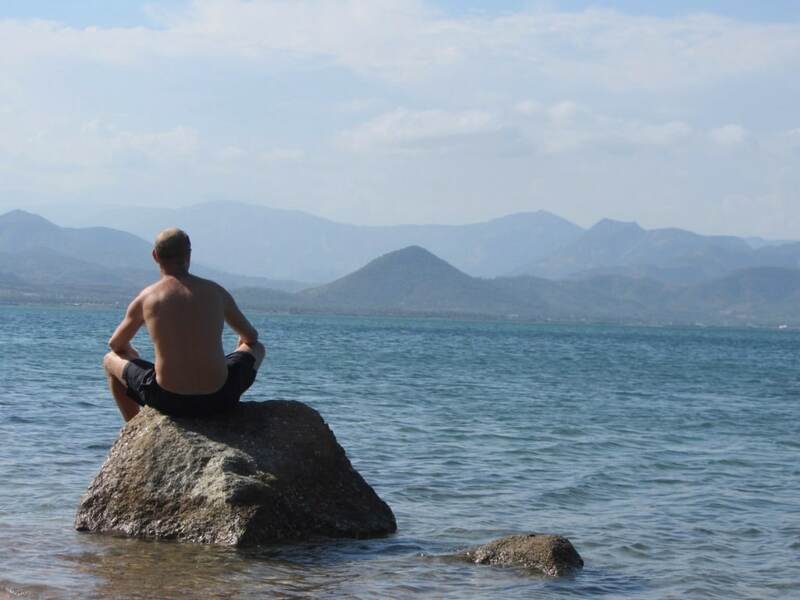 I have the plan to travel to Nha Trang end of this month, and then the next day i want to rent a motorbike to go to Cam Ranh, and from there a bus back to Saigon, so not returning to Nha trang. But could i return the bike in Cam Ranh you think? As far as I know you can’t rent a bike from Nha Trang and return it in Cam Ranh, but it’s worth asking when you’re there anyway. If it turns out that you can’t, you can always rent a bike from Hoa Dao Vang (see above) once you’re in Cam Ranh instead. thanks for your always fast replies. 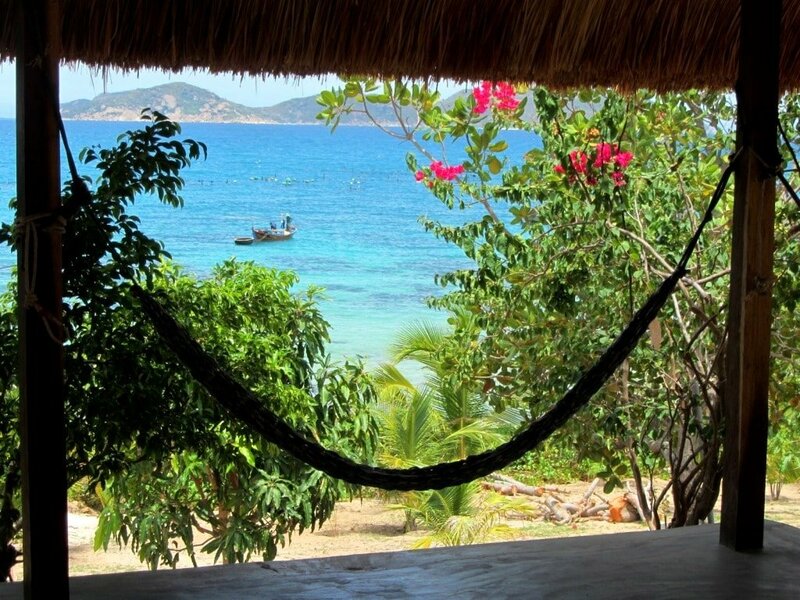 Really wanna make that roadtrip between NT and Cam Ranh as it sounds like a gorgeous one. Booked a bus to NT, so probably either gotta drive back to Nha Trang then or rent a bike there. Have a good one Tom! one more thing. Actually the beautiful route that you describe is Nui Chua Coast Road. But what about the road from NT to Cam Ranh, is it similar in beauty? 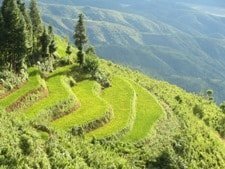 I want to book Dao Hoa Vang Homestay via your website but I see that there are no links to booking.com in this article? Thanks, but unfortunately you can’t book Dao Hoa Vang through my site. But when you contact them to book your room you can mention Vietnam Coracle if you like, they know me. Yes, Nha Trang to Cam Ranh is also nice: the first 30km south of Nha Trang on the airport road is very scenic. After the airport you have to cross a bridge and join Highway 1 for about 30 minutes which is a bit boring, but then after the turn off for the Nui Chua Coast Road it’s very scenic again. 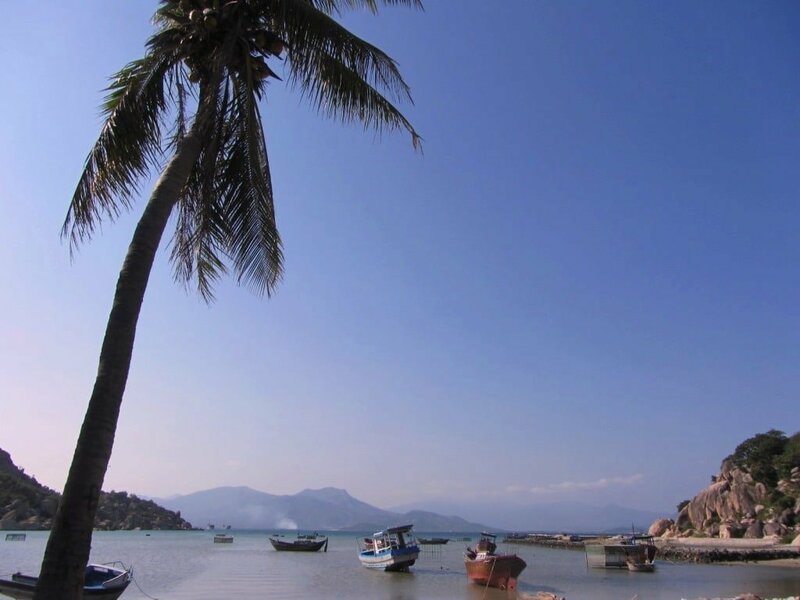 Hi Tom, we’re planning to spend 3 days around the Phan Rang-Cam Ranh area. How’s the coastal road? Is it more or less flat or very hilly? Would you recommend it for novices on motorbike? Alternatively, how is easy is it to rent a taxi to do a day trip dropping at several beaches to swim along the way? Also, is it better to stay in Phan Rang or at Sao Bien in Cam Lap? Thanks! The coast road between Phan Rang and Cam Ranh is fantastic – one of the best stretches of coast road in the country. It’s quite hilly but not much traffic and a good road surface, so you should be fine. Read all about it here. 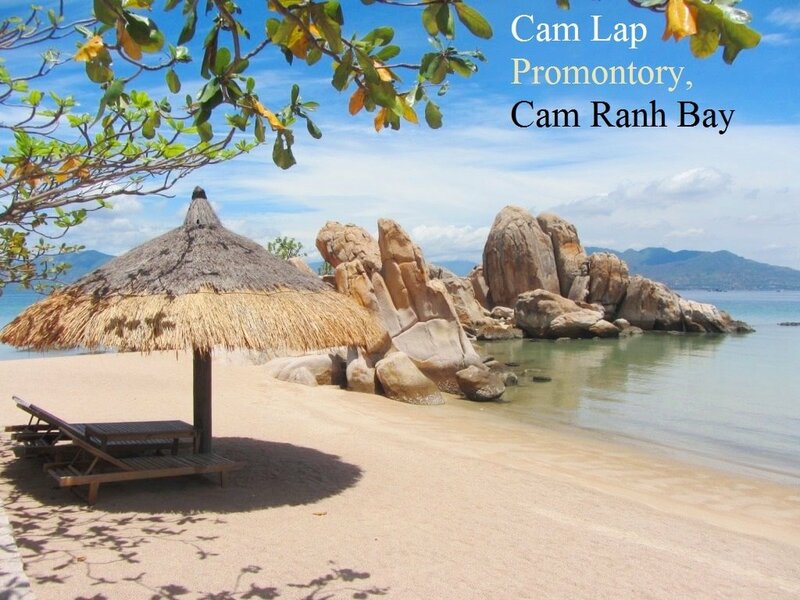 Staying on Cam Lap Promontory is better than staying in Phan Ranh. we like ro stay 2-3 nights in ngoc suong yen resort. how we can get an offer? nobody reply our mails. we are a family with 2 children (9 & 6 years) and we are looking for an accommodation on this beautiful bay. That’s strange that no one has replied to your emails. Have you tried calling them? yes, but they speak only vietnamese. Oh, I see. Well, as long as you don’t visit on a weekend or a Vietnamese public holiday is is unlikely they will be fully booked, so you can just turn up and get a room. We will be going there straight from Hoi An/Da Nang and since our schedule is a bit tight, we are looking for the most convenient way to reach it (we would have only two days there). Do you have any advise how to get there from the airport in Da Lat? The most convenient way to get to Cam Lap from the airport in Dalat would be a taxi, but of course that would cost a bit of money. Otherwise, you can get a bus from Dalat to Phan Rang, and then take a taxi from Phan Rang to Cam Lap. There are probably also minibuses from Dalat to Cam Ranh, but I’m not sure about that. Or you could even hire an Easy Rider from Dalat to take you to Cam Lap. (Easy Riders are experienced Vietnamese riders who take travellers riding pillion – the unofficial centre for Easy Riders is Dalat). Thanks for an amazing webpage! 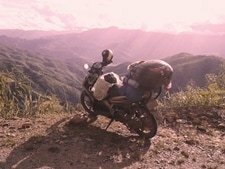 I would take Road QL20 and QL27 east from Dalat and then turn left at Tan Son for the Burnt Road (QL27B) to Cam Ranh – these roads are quieter than taking the Dalat-Nha Trang road. Firstly let me say thank you for your blog, its great! 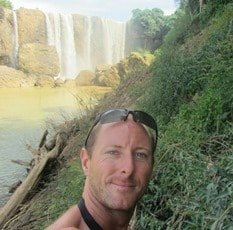 Myself and my boyfriend are visiting Vietnam for the first time from mid-March to early April for 3 weeks and I’m torn between a few options & wonder whether you might be able to suggest. The main thing I guess is while I’d love to explore we do also want a relaxing holiday too, so don’t want to overdo it and try and cram too much in. Tempting to try and do it all. We fly in to Hanoi and, after a couple of nights there, we are def keen on both Hoi An and Phu Quoc forming part of our trip. I’m trying to get the balance between visiting enough and not trying to cram too much in or spending too much of our time traveling. Tim is a quite a beach bunny while I like a bit of beach I like it mixed in with some local life and lovely landscapes & we both like a couple of places to grab a bite or drink. Neither of us are very fond of anything too crazily overrun with tourists or big concrete resorts – though also not expecting to be totally off the beaten track. We’ll be travelling by plane or train, or hiring a car with driver where that seems feasible/wise (ie not self-drivers other than possibly hiring a motorbike to go Hoi An to Hue via the Hai Van Pass). The main quandry is which to chose of the following for a couple of days. Thinking either somewhere in Ninh Bihn (yet to find the right place but that region), the Com Lap Promontory (prob at the Ngoc Suong Ven Bay Resort) or Ho Tram (prob at the Ho Tram Beach Resort). The latter two suggestions of both location and accommodation taken from your blog. We can’t fit all three in but could possibly do two of the three, or spend a bit more time in just one of them – if we did two I don’t know if I’m starting to work in way too much travel if we don’t have our own wheels? Ideally I’d love combo of sea and mountains but not sure how closely the two co-exist? The dream would be to be on the sea but day-trippable to some lovely mountain locations for part of our trip. I hope this isn’t too much of an imposition to ask but thought it might be easier if I just laid out some itinerary options I’m considering to get your thoughts? 2 nights (inc drive to) Ninh Binh province (yet to find which bit but somewhere). 1 Sleeper train (from Ninh Binh ideally) to Danang and taxi to Hoi An. Any thoughts you have would be amazing! If you choose Itinerary 1, it’s a good idea to book your transportation and some of your accommodation in advance, because it’s nice to have that all sorted out before you go, otherwise you will be spending time organizing and worrying about it while you’re in Vietnam. With Itinerary 3 it’s not such an issue because you’ll have more time in each place. Thanks for your amazing blog. I’ve really enjoyed the effort you clearly put into each post. I was wondering how traveling to Cam Lap and particularly staying at Dao Hoa Vang would be for an English (and French) speaking solo traveller. I’ve checked out the related links and everything looks very local which is amazing but seemingly difficult for someone who cannot understand Vietnamese.